This song resonates around my head as I reflect over the recent happenings on the streets of the Swedish capital – masked vigilantes, street brawls, police attacks. 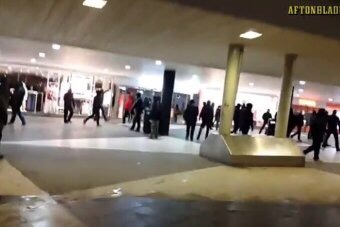 A group of masked men gathered in central Stockholm with the motivation of protecting Swedes by attacking immigrant street children. Flyers have been handed out around town with the message that ‘enough is enough’. A Facebook invitation has also been sent out asking for ‘Vikings’ to start patrolling the streets in gangs to protect Swedish women from ‘Muslim rapists’. What is this? What the hell is this? I don’t know what the solution is. But while we must remember it is illegal behaviour by a minority, we also must realise that it’s a symptom of a deeper panic. We can’t keep living in a bubble. 1) More resources must be directed to the law enforcement agencies. Tax income or small tax increases could be redirected to enable this. 2) Racist groups must be strongly counteracted. The consequences of their actions should be felt by them. 3) An education program for Swedes in schools must be instigated. Schools should talk about values, integrity and the benefits of diversity and pluralism. People are not born racist. 4) A huge media campaign on the positive aspects of diversity must be instigated – not least on the TV. 5) Refugees must be humanised and not marginalised. Tell us their stories. Who are these people? What have the faced? What are their dreams, hopes, wishes? 6) Traumatised street children must be cared for. Resources must be directed to this. Small increase in tax could easily finance it. We all gain from this investment. I know none of this is simple, but it must be done. Sweden is changing. Right now it is changing for the worse, developing out of fear and paranoia. This can be turned around – Swedes need to be reminded of what makes them proud to be Swedish. And that’s not gangs punishing street kids in the name of Viking culture. It’s the way that this country has welcomed people in need with open arms – more than any other country per capita. It’s the way this country has respected the right to seek asylum. That is Swedish. That is something for Sweden to be proud of.